Park Meadows Mall is the largest mall in Colorado and is located off highway I-25 in a highly congested commercial area. 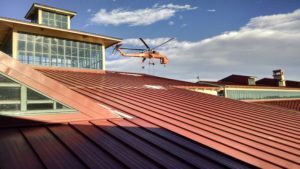 On one of the busiest holiday shopping weekends of the year, RK Service safely removed and replaced twelve 50-ton rooftop units (RTUs) by helicopter without inconveniencing mall customers. By utilizing the helicopter, RK Service was able to get all of the existing RTUs and install the twelve new curb adapters and twelve new RTUs in less than three hours.